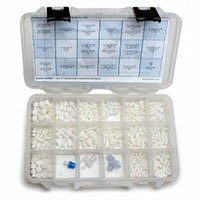 Luer kits contain many plastic parts made of a variety of materials, and some of those plastics may be autoclaved. This table shows the materials used in each of our kits and whether or not the plastic parts are autoclavable. Refer to our blog article to see which types of plastics may be sterilized and the appropriate methods for sterilization.